I have been visiting your site now for the last couple of months and have been keenly watching information coming in from all sorts of areas. On the photo that has recently appeared of 1958, I am in the front row, No 7....slight change in the name now as I am known as Helen, but then as Ellen Munro. The second row had my pals.,No 4 Irene Johnstone, No 8 May Mitchell and my best pal No 10 Agnes Ritchie. I recognise a lot of the other boys and girls, but so far can only remember either Christian or Surnames......TBC no doubt when I find my other brain cell. 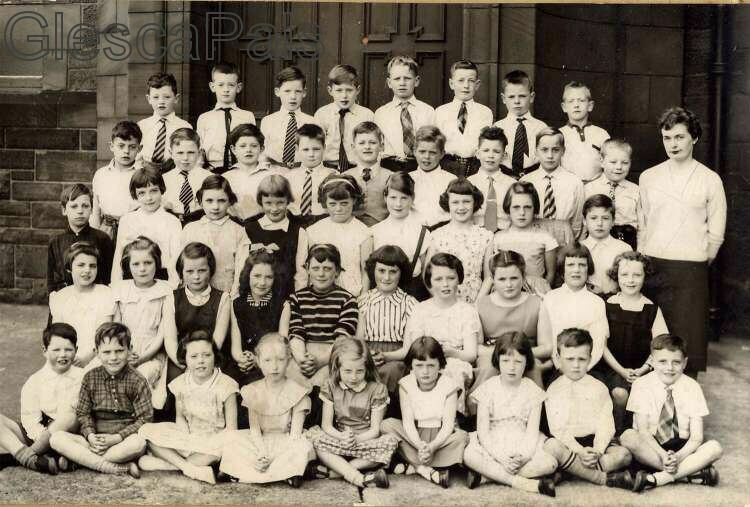 Hi webmaster I'm trying to put a name to faces on the Strathclyde Primary School 1958. Dear Webmaister, I can add to Stathclyde,P.S.photo,1958. I hope this information,is helpfull,as like Ellen Munro, I too, recognise faces, but cant put names to them, Im sure they will come to me eventually. Yours,Davie Crawford. "....... stathclyde primary 1958, T/row No4 John Ross, 3rd row No1 Tam Wallace ..... "
Strathclyde Primary, '58 class picture - 4th row, number 5, me, Colin Cooper Number one - Alex Clements?, Teacher Miss Reynolds? Congratulations on your splendid web site. It must take you hours to maintain so hats off to you! Well done! ........... Colin.